The community gold dig was over in Stanton and we found ourselves with some free time. We had a few hours in the afternoon and decided to make a trek to the nearby C-Gem GPAA claim a few miles from Stanton. The GPAA C-Gem gold claim is new and made its debut in the most recent GPAA Mining Guide. We studied the directions in the guide and set out for the claim. 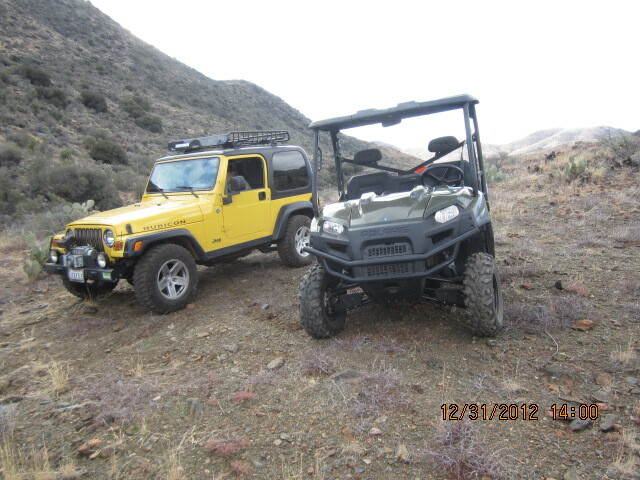 We made our way to the Old Stage Coach Rd/Yarnell Rd which is just off the small mining camp at Stanton. Following the directions we turned and headed the 2.1 miles towards Yarnell as the guide instructed. We had five people in an ATV and a jeep. The jeep led the way with our gps. Once we made the 2.1 mile mark there was no right turn. Looked like we were going to have to figure this one out. A typical TexanTreks adventure was on! The closest right turn to the mileage was actually a locked gate that looked like it headed into a residence set well off the road. We backtracked some more to a right turn just before a creek and went that way. The road was rough, but navigable for sure. 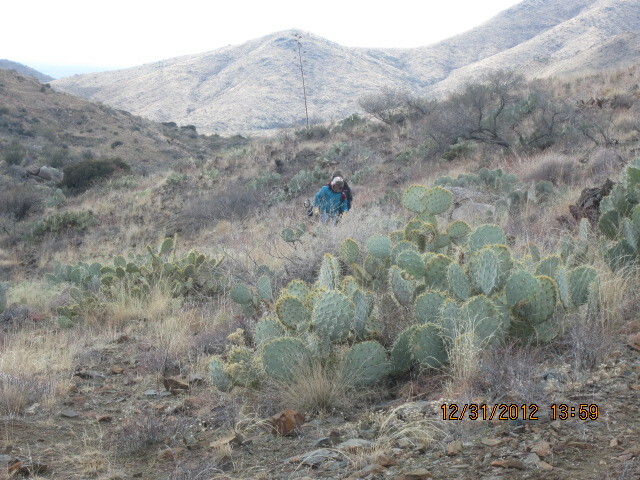 The mining guide gives the gps coordinates so off we went seeking the right spot. The farther we went, the worse the road became, but we were making progress towards the right gps position. There were definitely signs of mining along the road as it followed the creek. Up and down we went with the road getting worse and worse. Finally we could go no more. The trail had petered out and we were still well short of the gps coordinates for the claim. We parked and scouted out our surroundings. From where we were the claim was a hike up over a hill and downwards to the creek. Judging from our gps it was close to a half mile still. To get to the claim it would be a decent hike. We decided to stay in our immediate area rather than hike it. The creek/washout ran close though the climb down was a bit tricky. In fact pretty much anything you wanted to do here should be termed "tricky". I climbed down to the creek where there was evidence of previous prospecting. We also did a bit of metal detecting finding some old nails and such but no gold. I would say we only stayed an hour or so, due to the difficulty of locating the right area. In summation, the C-Gem is not easy. A rough road. A bit of hiking required. No real good flat terrain for metal detecting at all. It is beautiful country that's for sure and quite the adventure too. It definitely deserves more than the limited time we gave it. Check it out for yourself. It's only about 25 minutes from the Stanton Camp.